Also heard NYC (Paul, Quinn, Brendan) got fourth. And that another NYC/?? team, that might have done well, played really badly. hmmm. This entry was posted by Doug D on July 9, 2008 at 5:00 pm, and is filled under Bike Polo, Events-Past, Massachusetts. Follow any responses to this post through RSS 2.0. Responses are currently closed, but you can trackback from your own site. It would seem like there will be at least one team from Ottawa. Perhaps a reunion of Rival Gangs? OOTA for sure! T-Shirts on the way. Thanks for posting this up Doug. Glad to hear people are interested in coming out. Don’t forget your bathing suits!! Javier, can’t wait to play some polo with yalls again. Will definately be hitting yalls up on that! NYC is not disinterested in this tourny. If you mean that the NYC Courier Classic is the same weekend, I wouldnt worry too much, not even half of NYC”s traveling polo players race much. 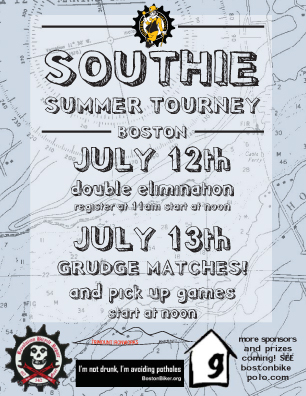 And of those that do, like myself, we can still roll up for the grudge matches on Sunday. I can’t speak for everybody but I’d bet on a few from NYC to be there. So no Doug then? How about the other 2? hey doug, put up the new and improved flyer! hahah doug did you hear about my attack plan for you… i guess you will have to wait till Ottawa and maybe even Chicago cuz i might not make it to Canadia. I hear Boston has lots of donut shops tho. You will be sorely missed and tribute will be paid to your absence. Zach is off at frame building school, so no Zach. I wish I could be in two places at once but still working on the capasatational fluxamatroner. Ian, I’m kind of boring, just like a regular glazed or maybe a sugar twist. What’s the plan?? los marcos and hostile takeovers will be there and possibly another team or just a few stragglers..
we’re all going try to come Friday night too..
doug, donuts are donuts. i don’t discriminate. i’ll crumble a bear claw with my head down and arm outstretched and then squeeze the inside of a chocolate glazed boston creme over top of it for all the fallen homies. The plan… you will have to wait ’til we square off against each other. Richmond is looking at 4 teams and a couple of stragglers. Martial Law might get instituted by the time we are done. Quinn I promise we won’t steal your beds this time. But, not really. I’m staying in NY this weekend. maybe changing my mind at the last minute. Brad said there’s some Red Bull girls from Jersey, so i may work a check point with them at the Courier Classic. Can’t pass that up. Nobody scores in Los Marcostan! Paul if you and Doug come to Boston then Banned in Dunkin’ Donuts can make their debut. I found two great donut shops in Southie for the Richmond guys. ok, Quinn talked me into it. i’m coming up! Ian, at least we can have the Donut Duo.